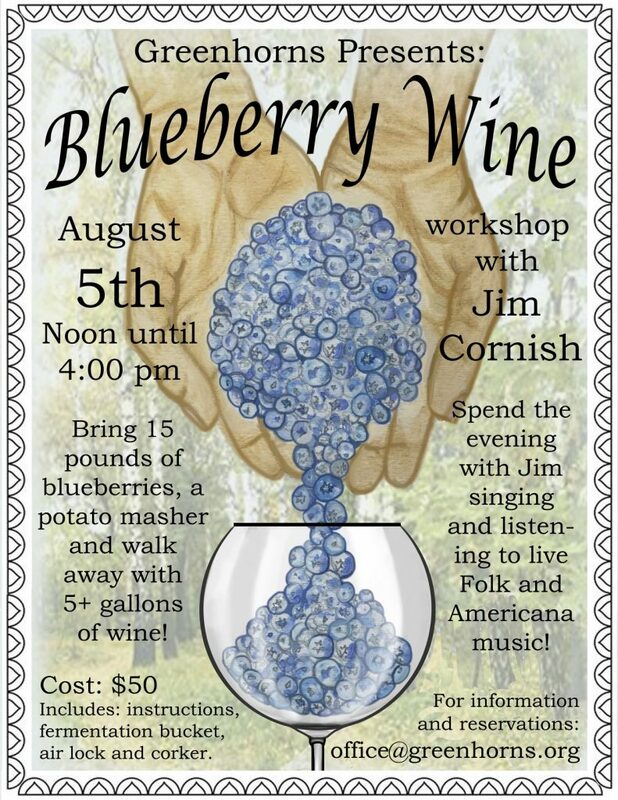 Join us on August 5th from noon until 4:00 pm for our Blueberry Wine making workshop with Jim Cornish. Participants are required to bring 15 pounds of blueberries (you can pick your own blueberries in our blueberry commons the morning of the workshop) and a potato masher the day of the workshop in addition to 12 pounds of sugar five teaspoons of lemon juice and five teaspoons of yeast to add on the third day after the workshop. The wine yield will be approx. 5 1/2 gallons. After the workshop spend an evening with Jim listening to and singing along to live Folk and Americana music that we all know and love sprinkled with a few original songs.